2016 has been a very eventful year for us personally and for Bath Old Time Dancers. We surprised others and ourselves when we decided to move from Bath where Paul and I were both born and bred. Having found a house in Wiltshire that we fell in love with, we sold our house and moved into our new house in August. However, we are only 11 miles from the hall where Bath Old Time Dancers meet so we are able to continue with the monthly dances. This year has been a record braking year for Bath Old Time Dancers where we now regularly get over 40 and in August we had over 50. We have had a few couples visit us this year who used to dance Old Time or wanted to find out about Old Time Dancing and are now regular attendees some joining The Old Time Dance Society. The Bath Summer Ball was back this year and it was extra special as it fell on the weekend when the Country was celebrating Her Majesty the Queen’s 90th Birthday. Many Bath dancers come with us to Winchester for The Southern Ball which we host and organise along with our friends Dianne and Terry, Joyce and Richard and Hilary and Nigel. It has become a popular event in the Old Time Dancing calendar and we hope to continue with it for years to come. Paul and I are delighted with the support we receive for the dancing holiday we organise in November we had over 90 dancers again this year and already have a waiting list for the holiday in 2017. At last we have found time to catch up with club reports, we have not had an opportunity to publish club reports for some time due to being busy with the Southern Ball, Bath Ball, The Old Time Dance Society work dancing holidays moving house and a short break in Italy to recover. We had record numbers in August with 52 attending and our new dancers are enjoying Old Time Dancing with the friendly group, one comment they made “I never expected to find so many people at an Old Time Dance”. September and October continued with good attendances 42 and 47 all enjoying old time dancing programmes with many of the dancers joining in with the leading. We are very grateful to Clare Lodge from Stroud who has kept the dancers supplied with delicious cakes. There continues to be a lot of interest in the Southern Ball and the Bath Ball 2017 and many of the dancers are looking forward to the Old Time Dancing Event in Weymouth and the Bath Old Time Dancers Holiday in Dawlish in November, which is full with over 90 attending. 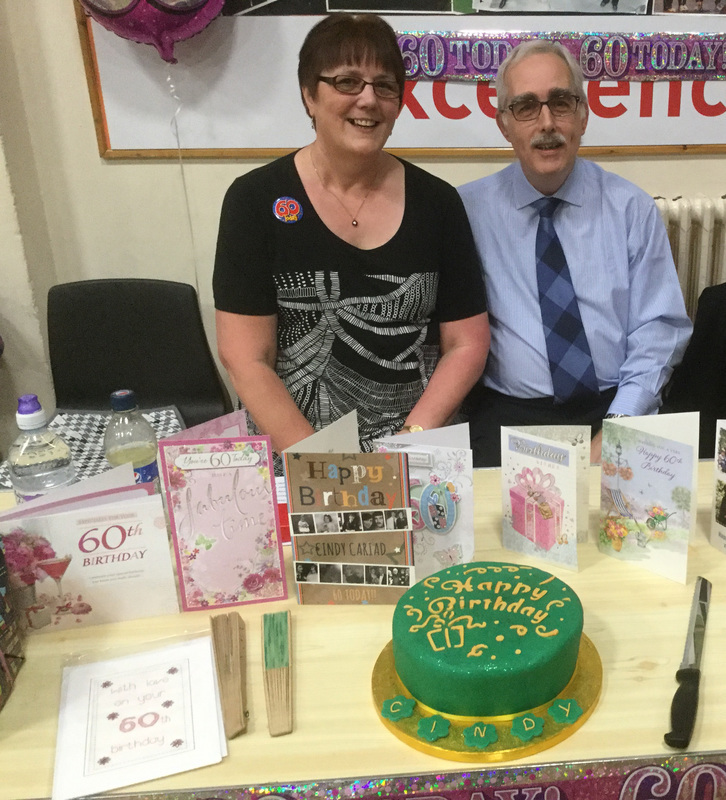 In October we had a special celebration, Cindy Hodges celebrated her 60th birthday on the date of our October dance. There was a real party atmosphere Cindy and Malcolm provided sherry and orange Juice Welsh Cake and Bara Brith. Bath Old Time Dancers presented her with a year’s supply of Jelly babies, her favourite sweet and a birthday cake decorated in her favourite colour of green. We are now getting ready and looking forward to the OTDS Autumn weekend and preparing for our dancing holiday. We are grateful for the support for the Bath monthly dances and hope everyone continues to enjoy Old Time Dancing. When we put the programme together for the March Dance we included the Lace Agate Swing and the Venetian Foxtrot, two dances, Joyce and Richard taught us on their January holiday. We were pleased that both dances were received very well and we will try to keep both these dances in our programmes. We especially enjoy dancing the Venetian Foxtrot and it is nice to have this dance back on programmes. The rest of the programme went down well and we had a good evening with 43 dancers. Another dance we have wanted to revive for some time is, The Californian, a dance we always enjoyed dancing at Bath and Oxford. We put our heads together with dancers from Bath and Oxford, who could remember dancing it, and with the help of Sue Kellie and Anne Lincoln, who advised us by email, we had a few practises and the steps came back. We have danced it as an extra dance at the last two monthly dances and have put it on the programme for April. Again it is another dance that has produced a lot of interest. As I finish this report we have just had the sad news that Anne Lincoln has passed away, Anne with John always helped us with our dancing and right to the end she helped us to revive a dance and keep Old Time dancing available for all to enjoy. We will always be grateful for all the help and advice both Anne and John have given us. We were both very sorry to hear the sad news and our thoughts are with John and his family.